Now I have two limited edition boxes! The shirt into the original box. This time, the box really contains a Cameroon shirt. This lion emblem was designed for the 2010 WC. 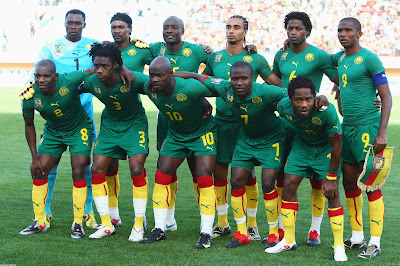 The team before the match against Japan in the WC 2010. -Honours: 4 Africa Cup of Nations (Ivory Coast 1984, Morocco 1988, Nigeria/Ghana 2000 and Mali 2002). Finally, it has arrived. And the delay was worth it: it was cheap, it's a limited edition, and it fits me perfectly. This time, the box roars instead of trumpeting (it's a bit annoying anyway). And I think that, by the moment, it's the most beautiful shirt I have in the collection.